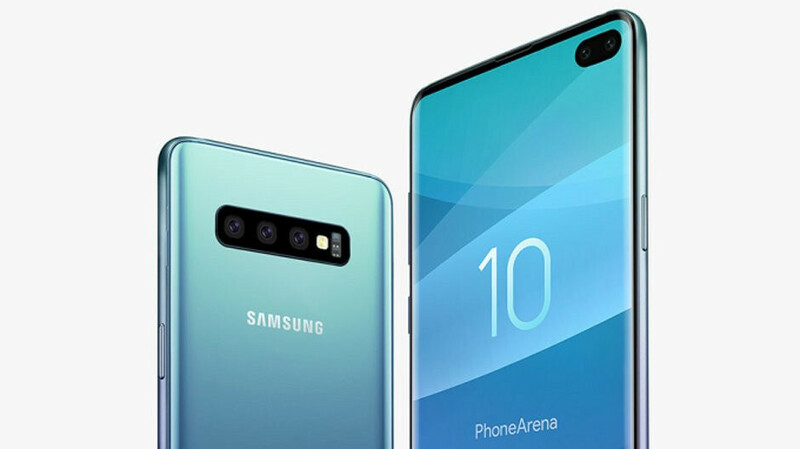 Whether its called the Samsung Galaxy S10+ or Samsung Galaxy S10 Pro as a rumor suggested today, Sammy's top-of-the-line Galaxy S handset is shaping up to be a beast, at least on paper. The phone is expected to be equipped with a 6.4-inch Super AMOLED display carrying a 1440 x 3040 resolution (which works out to a 19:9 aspect ratio), and feature the Exynos 9820/Snapdragon 855 chipset (the latter will be found in U.S. models) under the hood. The units with 6GB of RAM are expected to offer 128GB/256GB of native storage, and the variant packing 8GB of RAM should come with 512GB of internal storage. A few days ago, we showed you a picture of someone holding what appeared to be the Galaxy S10+. The front-facing dual in-display camera setup is one of the biggest clues to the identity of the phone. Today, tipster Ice Universe disseminated a tweet with the latest photo of the device (see image in the embedded tweet at the bottom of this article). While this isn't a live image like the previous photograph, the two in-display camera sensors once again appear in the upper right corner of the display. Even with a rumored 4000mAh battery inside, the Samsung Galaxy S10+ is expected to be a thin handset. The device will reportedly carry a girth of 7.79mm, which would make it the thinnest flagship phone from Sammy since 2016's Galaxy S7. The latter was 7.9mm thin. The Samsung Galaxy S10+ and the Galaxy S10 will meet the light of day on February 20th, during the next Samsung Unpacked event. Note 10 has my interest. I've owned every Note except the first one, but that hole in the screen might be a deal breaker for me. Not that it's 100% that the Note will have it too, but history says it's likely. A deal breaker? Lool bit extreme over something so small. Different strokes, different folks. Besides, I don't mean buying something else. I might just hang onto my Note 9 for longer & see what happens next year. That little hole in the screen would be (for me) a constant reminder that my camera is there...and it's watching me just as much as I'm watching it. Really liking the idea of the sliding selfie cameras that some OEM's are coming up with. Definitely I also want to check out the folding phone. Will lease the S10+ Then trade it in for the Note 10. It's the American way! No, that's how mafia works.